These sister parishes are rich in history. They have endured much, always to emerge stronger than they were before. 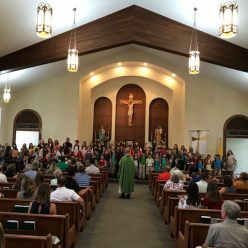 There are many activities, committees, ministries and organizations within our parish community that you may wish to join. As people of faith, we are called to reflect on God’s blessings in our lives. We are to seek out opportunities to contribute not only to the material support of St. Agnes and St. Lawrence Parishes but also by the use of our time and talent for the spiritual good of all. Please let us know if there is ever anything we can do to be of service to you!